Sidelined by your Adult Children? by Roseanne Rosen and Dr. Patricia James. This book defines sidelining as experiencing “behavior directed toward you by your adult child that makes you feel marginalized, diminished, disregarded, or disrespected.” Focusing on the common frustrations many parents face with their grown children, the book has a refreshingly zippy tone. This is evident in such section headings as, “Loving without liking,” “Poster kids with non-poster siblings,” and “Getting real about loving families.” Not for nothing is it subtitled, “How to Take Charge and Be Happy.” Real-life and relatable, “Sidelined” features a workbook-style format that allows you to write down your thoughts on the spot. See more about the principal author at www.rosannerosen.com. When Parents Hurt, by Joshua Coleman, PhD. This 2007 book is still the bible for all things that can go wrong between a parent and a grown child. 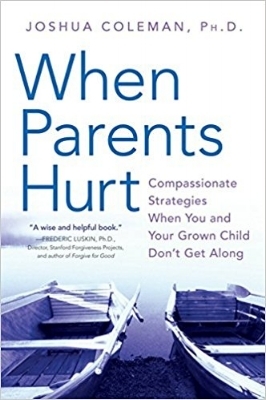 It really delivers on its subtitle, “Compassionate Strategies When You and Your Grown Child Don’t Get Along.” Having lived through a divorce and the fallout from it in the form of an estranged daughter, Dr. Coleman knows whereof he speaks. Not only does his advice ring true, it’s delivered in a way that’s clear, encouraging, informative, and eminently do-able. Two of his observations that I particularly like are,“You can do everything right and it can still go wrong” and “Parent and child may simply be temperamentally mismatched.” You can read Joshua Coleman online at Drjoshuacoleman.com/blog.